Over the past few months I’ve been thinking about how I wanted to proceed with this blog. I’ve had such a great time this year, trying new recipes and sharing them with my small sphere of influence via the world wide web. I knew from the onslaught that i wanted to continue, but the thought of keeping the blog the same seemed a little… well, boring? Tiring? So I’ve come up with a new plan for 2011. Last year, my New Year’s “resolution” was to eat more vegetables. I, if you know me well, am not what you would call a vegetable lover. I like them ok, but I get more excited about the main event… meat! casseroles! tantelizing flavors awaiting my anxiously anticipating taste buds… you get it, I’m a main course lover. Vegetables are a side thought for me. My husband, God bless him, is a vegetable lover. He was constantly asking what vegetable we are having with dinner. So I decided to make more of an effort in 2010. Last year was me putting my toe into the waters of vegetation. I made more salads (when I remembered). I bought bags of frozen vegetables, which works well, but after a while that gets boring. So this year, I have decided to tackle the daunting world of veggies head on. How do you make them exciting? Tantalizing? Mouth watering… a vier for the main event? I don’t know! But I’m aiming to find out in the next 365 days. My goal for the next year is to find methods, recipes, anything! that will make vegetables a more pleasing part of our diet. The ultimate goal being, really, to eat more vegetables. We all probably think that is a good idea, doing it is another story. So I hope you will join me for another year! I think this one will be a challenge! Toss pineapple and 1 tablespoon oil on large nonstick baking sheet. Bake 20 minutes or until lightly browned, stirring halfway through baking time. Transfer pineapple to large bowl; stir in tomatoes and brown sugar. Let cool to room temperature. Stir in cilantro and 1 tablespoon vinegar. Bring chicken broth and salsa to a boil in heavy, medium saucepan over high heat. Stir in rice. Reduce heat to low; simmer, covered, 20 minutes or until rice is tender and liquid is absorbed. Heat remaining 1 tablespoon oil in large saucepan over medium heat. Add garlic, cumin and allspice; cook and stir 3 minutes. Add beans and remaining 2 tablespoons vinegar; cook and stir 2 minutes or until heated through. Coarsely mash bean mixture with potato masher. Reduce oven temperature to 350°F. Spread about 3 tablespoons bean mixture evenly on bottom half of 1 tortilla; top with rice mixture. To form, fold right edge of tortilla up over filling; fold bottom edge over filling, then loosely roll up, leaving left end of burrito open. Repeat with remaining tortillas, bean mixture and rice mixture. Place burritos in ungreased 12X8X2-inch baking dish. Cover; bake 20 minutes or until heated through. 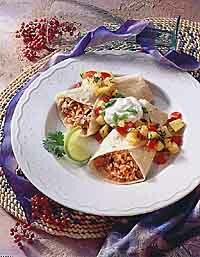 Serve with pineapple salsa, sour cream and green onions. I had never cooked pineapple before. It took mine a little longer to brown than the 20 minutes, and I kept a close watch on it because I didn’t want it to burn. It came out wonderful though and cooking the pineapple really does something great to it. The salsa was great. OK, I’m not really a bean fan, but I’ve been trying to expand my horizons lately. So this recipe was a stretch for me. I couldn’t bring myself to try the pinto beans so I used black beans instead. I think it worked just as well, but maybe not as pretty as pinto beans would have been. I had to add a little water to my mashed beans because they were pretty dry. I thought they spread better that way too. I’m pretty sure I added some Monteray Jack cheese to these bad boys. These burritos turned out better than expected. They really were quite filling and good. I’m fairly proud of myself for trying another vegetarian recipe! I can’t remember any low points, other than no meat. All in all I think we really enjoyed these and I’m looking forward to trying them again soon! Well friends, it is Thanksgiving and I find myself happily surrounded by my family. Like any traditional Thanksgiving gathering, my mom and sisters have been preparing for the big meal. Part of that preparation around my house is homemade pies. My mom has always been a pie baker and over the years, she has passed the tradition onto my sisters and me. 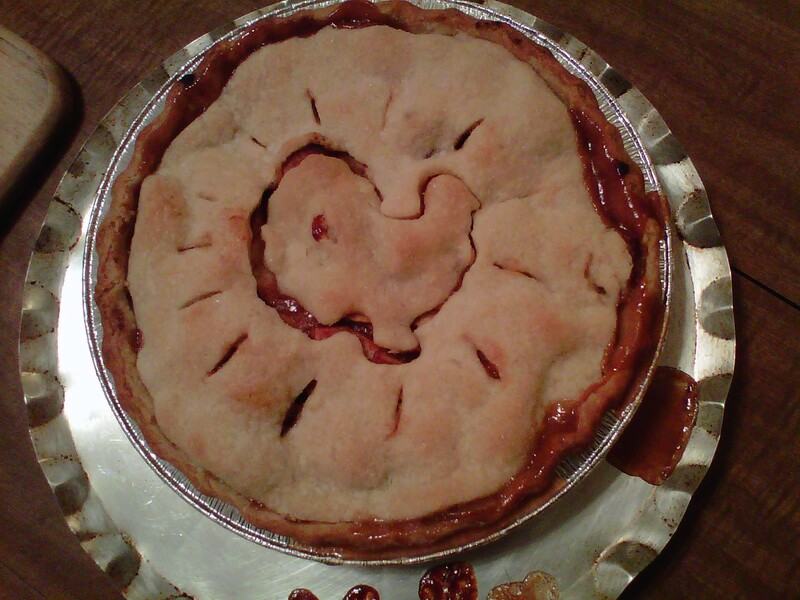 My youngest sister, Ruth, has even won a pie baking competition…first place! We’re pretty serious about our pie baking. This Thanksgiving we set out to make four different pies… pecan, blackberry, pumpkin, and apple. I was given direction to make the apple pie. So today I share with you my mom’s homemade apple pie, taken out of her original Betty Crocker Cookbook! We always make our own crusts too, which adds so much deliciousness to a pie, so I’ll give that recipe as well. Get ready for some good times baking pies! Divide dough into two equal ball shapes; between two sheets of wax paper, flatten one ball and roll dough with a rolling pin to be 2″ larger than your inverted pie pan. TIP: as you roll out your dough, you may need to readjust the wax paper. Just remove and smooth out wax paper as needed. Once you have your crust to the appropriate size, remove one side of wax paper and ease crust into the pie plate with the remaining wax paper side facing up. Once the crust is in place, remove the remaining sheet of wax paper. Trim edges and shape crust by either pinching into a fluted pattern or flatten with a fork. I found a nifty YouTube video that gives great instruction for this! Repeat process with second ball to make the top crust. In a small bowl, stir together the sugar, flour and cinnamon. Sprinkle sugar mixture over sliced apples, mixing to ensure even coating over the apples. Turn into pastry-lined pie plate. Top with thin slices of butter. Cover with the prepared top crust, cutting crust to fit within the pie plate. Cut slits on top. Bake for 40-50 minutes or until crust has browned and the pie begins to bubble. The most exciting part of this pie for me was the top crust. 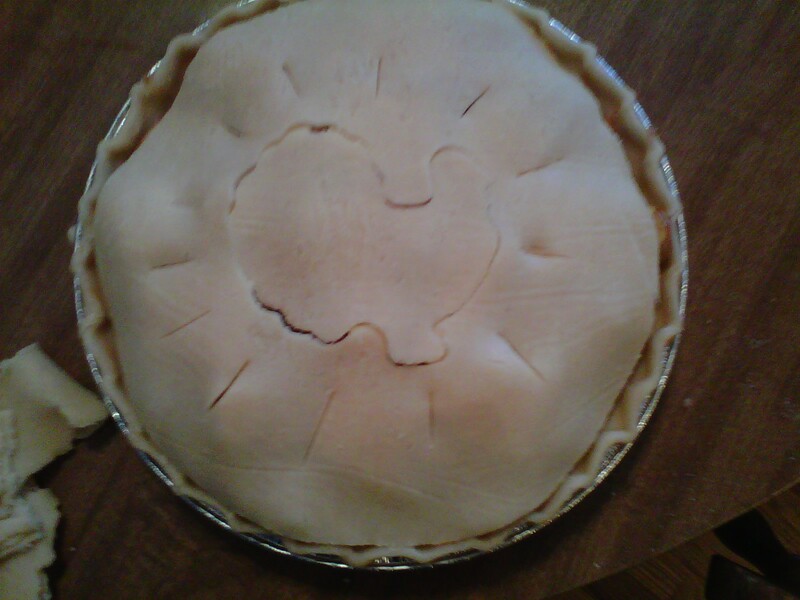 Instead of just making the standard slits to the top, my mom found a cookie cutter in the shape of a turkey and I stamped that into the flattened crust before laying it onto the pie. I didn’t remove the cut out but just let it bake as is. I think the turkey added a lot of Thanksgiving spirit! You could do this same trick with any shaped cookie cutter. The possibilities are endless! Santa Clause, Christmas trees, Easter bunnies…. Always put something under your pie while it bakes because inevitably, the pie will bubble over and you’ll have a mess in your oven. I didn’t realize, but my mom and sisters said you have to peel your apples. I was going to just slice up the apple, peel and all, but apparently that is not correct. So peel the apples. I accidentally trimmed the top crust too small. It didn’t make a big difference, but just be aware. The filling was super easy to make, other than having to peel the apples. A homemade crust is always a lot of work, but worth the effort in the end! I was so excited about my apple pie! Especially the turkey cut out! Happy Thanksgiving everybody! So I’ve been hearing a lot lately about the benefits of a vegetarian diet. Bob from the Biggest Loser is apparently a vegan (according to the episode I watched a few weeks ago) and spent a good 30 minutes talking to that week’s losing team about the benefits of eating only vegetables. It can be delicious AND nutritious! Sorry Bob, I love my cheese too much to give up all animal products. So no vegan for me. BUT I have been considering trying to incorporate a more vegetarian diet into our meals. Meat has been getting a bad rap lately. Apparently Americans eat more meat today than ever before. Some blame our current obesity trials on over consumption of meat. Unless you buy organic, meat can be full of hormones, antibiotics, etc, etc, etc. (One side note: poultry and possibly pork may be an exception to this. My chicken packages say that FDA regulations prohibit the use of growth hormones in poultry). Plus, meat is probably one of the most expensive parts of my food budget. In a large saucepan, bring rice and water to a boil. Reduce heat; cover and simmer for 35-40 minutes or until tender. 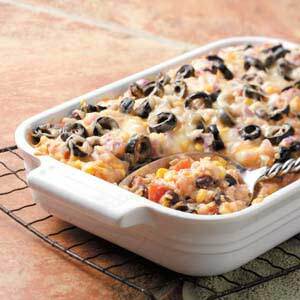 In a large bowl, combine the beans, Mexicorn, tomatoes, salsa, sour cream, cheddar cheese, pepper and rice. Transfer to a shallow 2-1/2-qt. baking dish coated with cooking spray. Sprinkle with onion and olives. Bake, uncovered, at 350° for 30 minutes. Sprinkle with Mexican cheese. Bake 5-10 minutes longer or until heated through and cheese is melted. Let stand for 10 minutes before serving. Yield: 8 servings. First off, I’m all about efficiency. Several months ago I discovered this nifty thing at the grocery store call “10-Minute” rice. Who knew?!? !Perhaps I’ve been living under a rock, but I seriously didn’t know such a thing existed. It even comes in the brown rice variety. So basically this is all I buy anymore. Who wants to take the time to let rice cook for 45 minutes?? Take my advice and get yourself some 10-Minute rice. You’ll not regret it! I had Mexi-corn on my grocery list, but when I finally found it in the canned vegetable isle, I looked at the ingredients and decided to put it back. Basically, Mexi-corn is just regular corn with a very small amount of red and green pepper mixed in. I figured I’d save myself some sodium intake and just use the frozen corn I already had at home. I used regular cheddar cheese for the whole thing and I think that was perfectly fine. Because I LOVE olives, I didn’t use a piddly 2 oz can of sliced olives. I used a full 15 oz-er and loved every mouthful of it!! This dish was surprisingly delicious. I’ll admit I had my fair share of skepticism as I find most dishes without meat to be less than filling. This one was not. If you follow the recipe to a tee and use the low fat ingredients as called for, you are only eating 339 calories for a 1.25 cup serving. That’s not bad! Because I did not use the low fat ingredients as called for, my calorie intake was probably significantly higher. My 15 oz of black olives probably didn’t help things either. All in all, this was a great recipe that I’m sure I’ll make again. It was warm and creamy and would be oh so good on a cold winters night! As you may have noticed from the title of this week’s recipe, we’re going on the ultra healthy route. These are guilt free pancakes my friends! No worries about eating six! This week we’re making Wheat Germ Whole Wheat Buttermilk Pancakes! Here is a great tip regarding the eggs… one reviewer noted that you can substitute flax seed for the eggs. Here’s how: 1 T. ground flax seed + 3 T. water replaces one egg. So much healthier! Since I happen to have flax seed on hand at all times, we made this substitution and didn’t see any difference at all! Did you know you can substitute apple sauce for oil in almost all baking recipes? Yes, it’s true! The sub is a 1:1 ratio. We made this change as well. My friend Jessica reminded me that if you don’t have buttermilk on hand you can make your own out of regular milk. To do so, just add 1 Tbsp lemon juice into a large measuring glass, add enough milk to make it 1 cup, and let it sit for 5 min before using. Since this recipe requires 2 cups, double the amount. These pancakes turned out fluffy and delicious! Jeff made them, not me! There were no “J” shaped pancakes on my plate. Hope you decide to give these pancakes a try… we really enjoyed them! When I was 25, my dad bought me a grill. It was Father’s Day and I’d called my dad to send my love and happiness for the occasion. He got on the phone and excitedly told me he had bought me a present. A grill! Wow! I was pretty surprised. My dad isn’t a gifter and this was the first time EVER that I’d been given a gift by my father that was apparently “just because”. Of course I was excited and wanted to know all the details… what was it like?!?!? “Well,” Dad starts, “It runs on propane. It’s about 18″ wide. It’s blue. It’s kind of the shape of a shell.” Hmmm. I didn’t know what to make of this description. In my head, I’m picturing a standard height, gas grill. While the blue color was odd, I could reconcile everything except the shell shape. I’d never seen a grill like that before. A couple weeks later I drove home to South Dakota to retrieve my new grill. What my dad had purchased me was indeed a blue, shell shaped, propane grill. When it’s legs were fully extended, it stood about 15″ tall and fit about 5 burger patties. It ran off of little camp propane tanks. After inspecting it, I fell in love… mostly because my dad had bought it just for me. It soon became known as the Blue Shell. When Jeff and I got married, the only wedding gift Jeff really wanted was a big, semi-fancy grill. I told him I already had a grill we could use, the Blue Shell. He told me the Blue Shell didn’t quite fall into the definition of “big and fancy”. When we returned from our honeymoon, parked outside on our snow covered deck was a brand new Grill Master. Jeff was in heaven. Six months later, we moved to New Orleans and the Grill Master got put into storage. Luckily, I still had the Blue Shell. The Blue Shell made the trek to Louisiana and Jeff made a little stand for it beneath the goose neck of our camper trailer. We happily grilled for months on the Blue Shell, even taking it camping with us in Mississippi. Sadly, the Blue Shell did not seem to be made for the moist Louisiana climate. After 18 months, the bottom had rusted out and the propane regulator rusted off. That was the end of the Blue Shell. That’s a really long introduction to the fact that this week’s recipe is Pizza on the Grill. You can see the original recipe by clicking HERE. In a large mixing bowl combine 1/2 cup + 1/8 cup flour, yeast and 1/8 tsp of salt. Add warm water and oil. Mix together until smooth. Stir in as much flour as possible (1/2 cup at a time). Turn dough out onto a lightly floured surface. Knead in remaining flour to make a moderately stiff dough that is smooth and elastic (6-8 minutes). On a lightly floured surface, roll dough into a 12-13″ circle. Let the crust sit 5-7 minutes for a thin crust. Longer for thicker crust. Preheat grill for high heat. Carefully place dough on hot grill. The dough will begin to puff almost immediately. When the bottom crust has lightly browned, turn the dough over using two spatulas. Working quickly, brush oil over crust, and then brush with tomato sauce. Arrange chopped tomatoes, black olives, peppers, onion, pepperoni and basil. Sprinkle with cheese. Close the lid, and cook until the cheese melts. Remove from grill, and set aside to cool for a few minutes. First off, I have to say I cheated a little bit this week. The only thing new about this recipe for me is the fact that it’s cooked on the grill. I actually make pizza all the time like this, but cooked in the oven. 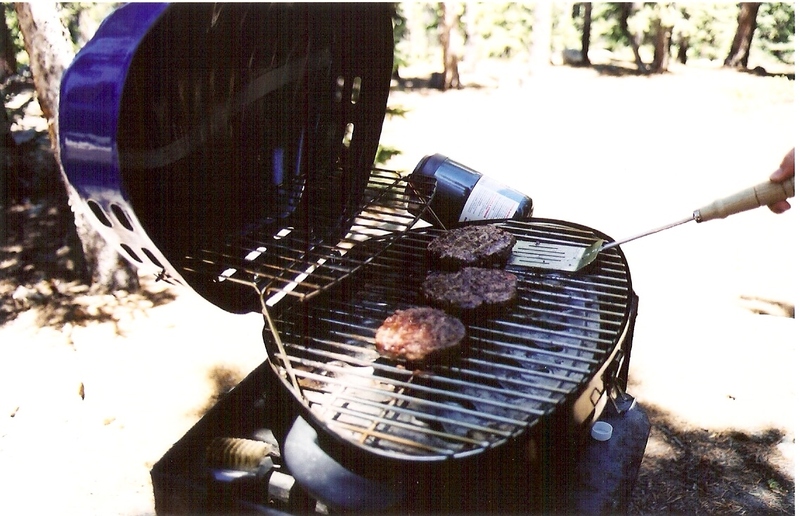 With that said, I also didn’t really follow the original recipe at all, except when it came to grilling instructions . I used the same recipe for the pizza dough that I posted under HUMMUS PIZZA . I like my pizza dough recipe because it only takes about 2o minutes to make instead of this hour to rise business which is what the original recipe called for. It would be worth your time to click on the original recipe link above just to look it over. The crust did sound delicious, but I didn’t have that much time. If you decide to use my dough recipe, after you roll out your crust, let it sit and rise for at lease 15 minutes or longer. I found that a thin crust cooked a lot faster. Jeff had preheated the grill to 500 degrees because that’s what he usually does. Next time he won’t get it that hot. We put the crust on the grill and within one to two minutes, we had to flip it because the heat was so high and the first side cooked really fast. Have all your toppings ready and waiting! It doesn’t take long for the crust to cook at all! Once we flipped the crust, and quickly got the toppings in place, the pizza only was on the grill for about 10-12 minutes. Jeff had turned the heat down by that point. This is a really fun way to make pizza! There is just something yummy about flame cooked food. We love grilling and we love pizza. The two together was great. This recipe will take some perfecting. I found there is a delicate balance between the cooking the crust, making sure it doesn’t burn and letting the pizza cook long enough so the veggies and other toppings cook too. Our crust turned out maybe a little crispy, and the veggies probably not cooked enough. Like I said, it will take some perfecting! Definitely liked Pizza on the Grill. It was a fun experience and I’m looking forward to getting better at it! I have a friend named Ben. Ben likes to cook. Ben is a very good cook. This is my story about Ben’s cooking. Ben, Jeff, myself and a couple of our other friends used to lead a small group. We would meet on Thursday nights at the house I shared with a bunch of roommates. At this point in life, I worked in Denver. Working in Denver ment I would drive 50 miles to go to work and 50 miles home again each day. That was a long day. By the time I would get home, there was only a small bit of time before people would start showing up for the small group Bible study. I would usually throw a potato in the microwave, zap it for several minutes, pile butter and sour cream on the top of it, scarf it down and call it dinner. But every once in a while I would arrive home on Thursday nights to a neat little tupperware filled with Ben’s deliciousness. It was called heaven. Every once in a while, Ben would have made me potato soup. Ben’s potato soup was no ordinary soup. Ben made his soup completely from scratch, making a cream reduction and who knows what else. It would take him all day to make this soup. And I’m pretty sure it wasn’t necessarily that healthy for you, but the flavor made up for that fact. It’s been a long time now since I’ve had Ben’s potato soup, but the memory of it is seared into my mind. And it’s memory popped up this week as I was trying to find a new recipe. Instead of using water and chicken bouillon granules, I used canned chicken stock. I think I only used 2 3/4 cups of stock and just plain water for the rest. I always do this. I add more ingredients than the recipe calls for and then am surprised when I have so many leftovers. Hmmmm. I probably used 4 1/2 cups of potatoes and I didn’t measure my other veggies. I had A LOT left over. Should have followed the directions. A couple things regarding the potatoes. I read somewhere that the skin of a potato is what contains all the vitamins and nutrients that potatoes offer. So I usually try to leave the peels on whenever possible; I didn’t peel my potatoes. I will say that the skins do add a certain texture and flavor that not everyone may like in a soup. Also, I took a potato masher and mashed everything up in the end. Ben’s soup was always very creamy, not chunky and I liked that. Because I mashed everything, my soup ended up really thick. I think I could have added more water at the end. I added cheddar cheese to the pot at the end. YUMMM. I should have added more. Cheddar cheese makes potatoes in any form better! Very quick recipe. Dinner was ready within 30-45 minutes. The flavor was good… not Ben good, but still good in a 45 minute way. It was thick, hearty and warm in my tummy. I had a lot of left overs. This was more my fault than the recipe’s really. I don’t usually have left over ham just laying around waiting to be used. And as always, I have a hard time coming to think of soup as a main dish. While this soup really was no match for Ben’s all-day creation, it was still really good. I can imagine eating this on a cold, blustery winter day while the snow is falling outside…. or in my case, on a chilly, windy winter day while…. ummm, rain falls outside??? That’s Louisiana winter I guess!